The Enviro Pulse Jet Bag Filter is cleaned by a blast of compressed air. The filter bags are arranged in rows normally 12 or 14 per row and the number of rows depends on the filter size. A blowpipe is mounted above each row of bags and fed by a compressed air manifold (or tank) mounted on the outside of the filter. The blowpipe contains nozzles to coincide with the centre line of each bag. The cage that supports each bag incorporates an internal venturi mounted from the top wires. When each pipe receives a signal to blow, the appropriate diaphragm valve is opened by means of a solenoid valve allowing compressed air into the blowpipe. An equal amount of compressed air is blown vertically downwards into each bag via the venturis. The venturi is fitted to increase the air entrainment down the bags. The additional air supplements the compressed air and adds to the cleaning process. Each row of bags therefore receives a short pulse of compressed air of approximately 100m sec duration. The high pressure compressed air creates a shockwave down each bag causing it to release the majority of dust formed around the outside. This falls into the hopper below. Each row of bags is normally cleaned at random so as not to clean one particular area of the filter at any one time. The signal to control the opening of each solenoid/diaphragm valve is instigated by an electronic sequence controller/monitor. The controller is fully adjustable in relation to pulse duration and pulse time i.e. the time to clean the complete number of rows of bags. Also within the controller is a differential pressure transducer. This is piped up to the inlet and outlet side of the bag filter and measures the differential pressure or pressure loss across the filter. This value is displayed on the monitor and also has a 4-20mA output signal. The controller is configured to operate the compressed air system between two set limits i.e. a 'clean' limit and a 'dirty' limit. When the controller has cleaned the filter down such that the differential pressure is below the clean limit, the compressor will offload until the filter pressure differential has increased up to the dirty limit, at which point the cleaning cycle will recommence. The pressure differential control is a means of saving energy as it will only use compressed air when the filter is dirty and requires cleaning down. 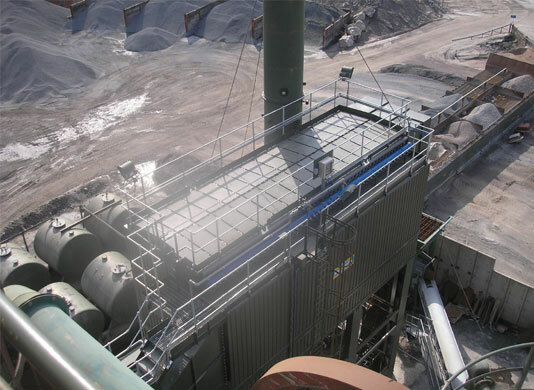 It is ideally suited for plants that may not operate on a continuous production run or where the dust carryover to the bag filter is not particularly high and continuous cleaning is not required. Various additions can be added to the controller to allow for remote monitoring of the pressure loss across the filter. This would involve converting a 4-20mA signal to pass to a PLC. There is also a high level alarm that can be taken from the controller again to a PLC that will indicate that the filter has reached a preset maximum pressure differential i.e. for some reason the filter is not cleaning down correctly. Pressure transducers can be fitted to the compressed air manifolds to detect a change in pressure within preset limits. If a diaphragm valve refuses to open or alternatively a diaphragm valve sticks open and does not close these transducers will interrogate the controller allowing it to indicate which diaphragm valve and hence which row of bags has a fault condition. A 'burst bag' locator can also be fitted in combination with a dedicated Dust Monitor. The pulse jet filter operating principle is totally different therefore to the reverse air cleaning principle. Reverse air cleaning introduces an amount of cold air into the cleaning system in order to clean down the bags. This cold air can cause dew point conditions within the bag filter if the inlet temperature is low with high humidity. The cleaning air can rob a corresponding amount of air from the process. 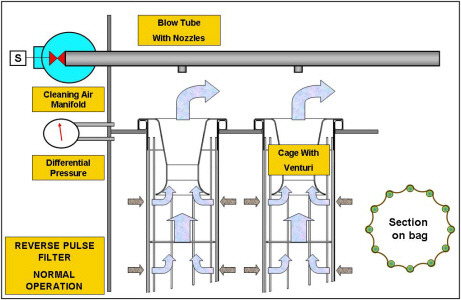 If the cleaning mechanism is not set up correctly a considerable amount of air can leak through the cleaning system into the bag house again cooling down the incoming air and reducing the air drawn from the process. 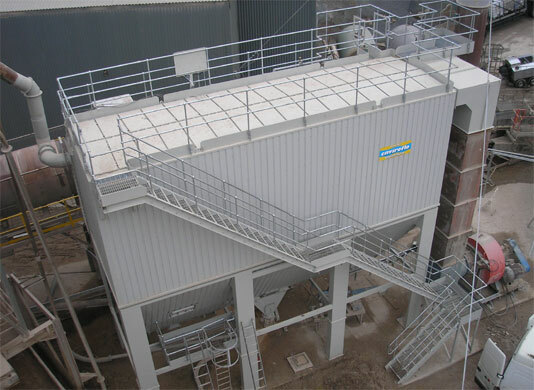 An Enviro Pulse Jet Bag Filter is normally mounted on a pyramid or trough type hopper and supported by a common steelwork configuration. The filter would arrive on site with filter bags and cages already installed, together with the cleaning system.